Located in the heart of the Sonoma Coast, CrossBarn is an innovative winery led by renowned winemaker Paul Hobbs. Dedicated to crafting wines of stunning quality and exceptional value, his approach combines sustainable vineyard practices and traditional technique. These sophisticated yet approachable wines focus on the expression of California’s most celebrated AVA’s, including Chardonnay from the cool Sonoma Coast. In this maritime AVA, the 2016 growing season was cooler on average than the previous three years, with low daytime highs and chilly nights. Fruit ripened slowly and evenly, with no rapid heat spikes; quality was exceptionally high. 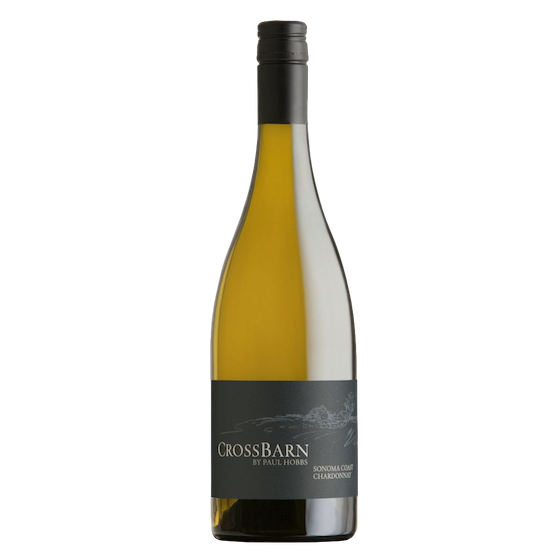 Produced using hand-harvested fruit from carefully selected vineyards within the Sonoma Coast appellation, CrossBarn Chardonnay balances structure and weight in balance with pure, concentrated fruit. Bunches were whole-cluster pressed, and juice was fermented by native yeast, 90% in stainless steel, 10% in oak. Following five months maturation sur lie with weekly bâtonnage, the wine was bottled unfined, with minimal sulfur added. Brilliant pale yellow, with enticing aromas of lemon curd, brioche, and white flowers, this Chardonnay showcases the fresh, bright essence of the Sonoma Coast appellation. Flavours of ripe apple, baking spice, and sea salt ease into a long, crisp finish with bracing acidity and pretty minerality.